As part of my MA, I researched the London Film Communities currently available. Here is the list. My most recent project for my Raindance MA was a Research Methods Report. For this, I researched the Film Communities currently available to London-based filmmakers. This was aimed to help me place Action On The Side within the market, and to determine its USP (Unique Selling Point, or Value Proposition). My overall MA goal is to develop AOTS into a sustainable short film business model. After doing all the research, I had a large appendix with details on film organisations. And why not share that information? Of course, since writing the report, new communities have cropped up, or I found ones I should have included. Please add a comment if you see any errors or omissions and I will amend them accordingly. What is Action On The Side? At the London Screenwriters Festival this past weekend, I met six brand new people who, when I said I run Action On The Side, knew what it was. So, let me answer: What is Action On The Side? In July 2013, James Doherty, a motion designer who wanted to direct, set up a project for filmmakers. Get together and make a short film in a month. This was Action On The Side. The concept is simple. Get together and make a short film in a month of weekends. 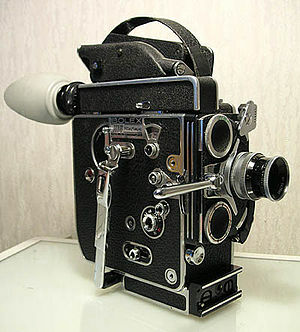 It is designed for people who make films in their weekends and evenings. Those of us with day jobs or who study. It also recognises that we need deadlines to finish projects; otherwise they will just drag on and on. I took part in the first event. A group of 25-30 of us in the Medicinema in Westminster broke into two groups and produced two films. James produced one, I produced the other. I got to talking with James about promoting Action On The Side (AOTS), and was invited to co-organise the project. James and I co-ran the projects until he stepped out to direct ‘Breathe‘. AOTS has run seven projects, has entered one competition, and has produced 11 short films. Our 8th project is November 2015 — and it’s starting in 8 days! Since I’ve been running AOTS, we’ve been developing our community. Our facebook page has 330+ followers, and our twitter has 480+ followers. Every day we share links to articles, tips, tricks, and inspiration to our social media followers. 9am every Monday we share a scriptwriting challenge: write a 3-6 page short film in x genre. Include a x prop. The challenges are designed to inspire scriptwriters to write a short within a week. If they take up the challenge, they develop their writing skills (just by the act of doing), and develop scripts that they can bring to our script development meetings. We trialled script development meetings last year, and started running regular meetings earlier this year. The script development group has been named ‘Screenwriters On The Side‘, and now meets fortnightly. Any one can join us, and can bring their scripts or ideas for feedback. Our February short, ‘Arms Trade‘, was developed by three regulars (James, Chris, and Josh) at our script development meetings. Our July short, ‘Drunk Dialling‘, was an idea that Rosie brought along to our first regular script development meeting. The subsequent meeting she had a first draft. The next meeting she had her second draft. And so it continued until the July project where the film was pitched, selected, and made. So why the blog post? I recently started my Masters degree with Raindance. The MA is negotiated learning: meaning we negotiate what our focus is going to be. My masters is designed around Action On The Side. Specifically, my learning goal is to develop AOTS into a sustainable film business model. I’m currently working on a Learning Plan, whereby I outline the steps I’ll be taking to achieve my learning goal. Part of this process is working out what I want to do with Action On The Side. What does it mean to me? Why do I want to develop it? So what does AOTS mean to me? Action On The Side is a collaborative filmmaking model. You get to make a short film with a new network of people. You see who you like working with and you work with them again. There are people I met through the project who are great friends now. There are people I will work with and recommend for jobs (and I have). You get to try new ideas out. A lot of the ideas that get pitched are ideas that people have had percolating in their minds for a while, but have never had the chance to get out and make. When I look at the people who take part in AOTS, they fall into three categories. Filmmakers who are new to London, looking to develop their network. Filmmakers who know one aspect of film but want to learn another (quite a few who want to direct, but want to learn other roles first). People who are new to filmmaking but want to get into it. That’s 2/3rds of the members using AOTS as an educational model. Now, what do I get out of it? I’m a Producer. I love producing films. I love getting people together and sharing a love of film. I get to produce content. I think every film is a learning opportunity – so I learn from the films we make as well. I get to learn from the people who join our group, who have different (film) backgrounds. I get to learn from others who are passionate about film. I get to experiment, try new things out. But also, I’m like the educational aspect. I taught film for two years, and I love sharing my passion for film. I’ve trained in many different film departments, so I get to teach people what I know. Don’t know how to use the sound kit? let me show you. Want to know how to schedule a film shoot? let me show you. Don’t know how to pitch? let me help you. And, as a producer (and writer), I get to help develop writers and their scripts. There are writers returning to the script development meetings with better and better scripts, all getting closer to being ready to be shot. I helped with that. But what do I want out of it? I think the AOTS model is a great opportunity for filmmakers. I want it to grow. I want to grow AOTS in London. I want more teams taking part. I want more filmmakers taking part. I want multiple films being made during the projects so when we have the screening at the end of the month, there are more films being screened. I want to take AOTS outside of London. I want to run AOTS in other UK cities. Hell, in other countries. Let’s get a few AOTS’ running a month. And then, when we have multiple films being made in a month, we can have screenings showing all the films that were made that month during the project. Imagine the London shorts, the Manchester shorts, the Berlin shorts all being screened on the same day! I want it to be a training ground for filmmakers. I want the returning filmmakers to be making better films that we submit into film festivals and win competitions. I want new filmmakers to come in, learn, and develop their filmmaking talents so they grow with the organisation. I want people to come regularly to the script development meetings and develop their writing skills so they are producing great work. I want to run film screenings and q&as and workshops so people can learn their craft. I want to run a vlog on filmmaking, producing content regularly, which Actioners can help to produce. I want to run our own film competitions. A 48-hour film competition. A one-minute movie competition. Cinema SoundEX. I want to run funding for short films. I want people to come up to me in a few years’ time and tell me they took part in AOTS in x city, and developed their craft, and now have an awesome network of filmmakers they work with all the time, and now they’re working commercially, and winning awards with their films. So how is does the MA help me? Over the next two years of my MA (which I’m doing part-time whilst running my business and running AOTS), I’ll be developing AOTS into a sustainable business model. These skills are closely related to my role as a producer and educator. Now I don’t know exactly what will come with this business plan. I’m still working that out. But I think these skills are being developed so I can be the Executive Producer to other Producers running the project. I’m going to doing market research into other film communities within London. What are the opportunities available to London filmmakers? And from this research, defining Action On The Side’s unique selling point (USP). I’m going to be running a vlog on filmmaking. I’ll be interviewing people making films, running film communities, showing what goes on behind the scenes and what every ones role is on set. I’m hoping regular content creation will be developing our audience and brand awareness, not just for AOTS but for me as a producer and educator as well. I’ll be developing resources for the project, and trialling them with the projects (we’re running AOTS in London every 4 months). This will include meeting with a Media & Entertainment Lawyer and developing the project’s IP. I’ll be developing a handbook, outlining how to run an AOTS project, so someone else can produce a project. This will include defining the AOTS brand and outlining its management. And then, with all of these resources and research and development, my masters project will culminate in a Beta test — running AOTS in a new market, outside of London. And making sure that the development that I have done until that point results in a sustainable project (e.g. a project that gets good feedback, and that breaks even or makes a profit that we can invest in the next project). It’s a lot to do. If you’re in London, join us for this November’s project. If you’re not in London, but have friends who will want to take part, direct them to sign up. Or at least join our mailing list. If you don’t live in London, but like the idea of Action On The Side and think there’s a community of filmmakers near you that will want to take part, send me a message. I can bring the project to you. Now this November is the first time we’ve asked Actioners for a fee up front to take part in the project. Previously we’ve advertised the event as free, but then, once we had selected the film and knew the budget, would ask for £30 or so to go towards catering and equipment and transport. Sometimes people would pay; often times they wouldn’t. This was fine – the Executive Producers (me and James) would pay a bit more because, hey, we were making movies. Since quitting my job in July and going freelance, that’s impossible. Our costs have gone up, so now the fee is up front. It’s £40 to take part in the project this November. My MA is focused on how to make this great filmmaking project sustainable, so it can keep growing and developing and supporting filmmakers. If you like what you’ve read, and you want to support Action On The Side and this filmmaking journey that I’m going on, then sign up to the next project and let your friends know too. I look forward to sharing this journey with you. As part of my degree, I have written on an influential director. I go into the work of Park Chan-Wook with a focus on his mise-en-scène. In 2005, as part of my undergraduate Film degree, I had one course remaining. The only option was a course in Contemporary South Korean Cinema. It turned out to be one of the best courses I had ever taken. During the course, we were introduced to a wealth of cinema. Starting with IM Kwon-Taek’s ‘Sopyeonje’ (2000), the course introduced us to the work of directors LEE Chang-Dong (Peppermint Candy, (2000)), KIM Ki-Duk (Spring, Summer, Fall, Winter … and Spring (2003)), BONG Joo-Ho (The Host, (2006)), KIM Ji-Woon, (A Tale Of Two Sisters, (2003)), and the work of one of my favourite director’s of all time, PARK Chan-Wook. The first film of his to which I was introduced was ‘J.S.A. 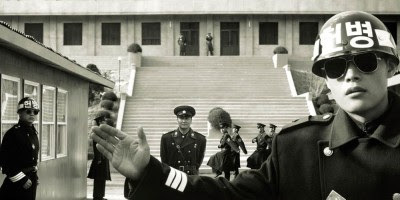 Joint Security Area’ (2000), a thriller based in the DMZ. We ended the course with a screening of ‘Oldboy’ (2003), one week before the film was due to screen for the first time in New Zealand at the International Film Festival. I had such a phenomenological response to the film that for one whole month after seeing it, I would flash back to its penultimate scene, (involving scissors and a body part), as though a nightmare was haunting me. I have not, to this day, been as affected by a film as I was with that. Until I saw Cut, his section of The Three Extremes (2004), an anthology horror film with shorts from Takeshi Miike and Fruit Chan. What attracted me to the work of Park Chan-Wook was not just the violence in his films – those who know me can attest to my love of all things violent in films. I think there should be more violence in films. I love it. MOAR! – but his mastery of mise-en-scène. During the production course as part of my Honours degree, 2010, our teacher, Alex Funke, gave the class an exercise that Sergei Eisenstein gave to his students in 1933. It was a challenge. The actors entered had an interaction at a door, moved into the room, came towards the only window, one bent down to pick something up, another murdered them from behind, and we saw the lifeless body on the ground. All of this had to be seen from one angle. After trying so many different angles and lens lengths, we were finally shown the way the scene was shot. The exercise was to find the one angle to shoot and block the actors so that all the action could be seen. What we learnt was to focus on the actors, direct their movements to help tell the story. We also learnt, again, that our default reaction as young filmmakers is to come up with a long list of shots, rather than telling the story in an efficient and concise way. This exercise was borne from Eisenstein’s research into mise-en-scène and mise-en-cadre (otherwise known as mise-en-shot). Ever since being introduced to Eisenstein’s exercise, I have wanted to analyse Park’s films through the lens of Eisenstein’s research into mise-en-scène. Mise-en-scène translates to “putting on stage”, and has been used within film to denote the placement of key elements within a scene. It includes blocking, camera angles, camera movement, lighting, art design, props, costume. The stage is the screen in cinema. Mise-en-shot, by comparison, is the shot composition; what is placed specifically within the frame of a shot. In ‘Sympathy For Mr Vengeance’ (2002), the first film of his Vengeance Trilogy, I noticed that he was using shot setups and character blocking in a way that enhanced his telling of the story, and in a way that I had not seen before. In one scene, deaf-mute Ryu tries to get Yu-Sun, the young girl he and his sister have kidnapped, into crying so he can take a photo to send to her father for ransom. This was done in one shot (31’26 to 33’36), with Yu-Sun running off-camera, Ryu chasing her but remaining within the frame, taking a photo of her off-camera, and she runs back into frame. The director’s choice of how to tell the story includes setting up the frame and directing the actors Every one of Park’s films includes stunning setups and shot compositions that aid in telling the story. His framing and blocking actors are quite simply beautiful and show a mastery of filmic vocabulary. In one of the classes for my undergraduate film degree, in 2003 or so, we were given a shooting exercise. Take the below script excerpt – a piece between two characters – and, in groups, shoot it with a maximum of four static set-ups. The excerpt was from ‘Lone Star’ (dir. John Sayles, 1996, see Appendix One below). All of the groups struggled with keeping to four set-ups. We all had wide shots, close-ups, a mixture of 2 shots. Then we were shown the scene as it was shot in the film. It was one shot. One static shot. The purpose of the exercise was to show us that new filmmakers always use too many shots, more than are needed. Simplicity is important; choosing the best shot, rather than too much coverage. Let the actors dictate the performance rather than your camera shots. There is a famous scene in ‘Oldboy’, clip below. In it, our protagonist, Dae-Su attempts to escape and has to fight through a corridor of henchmen, armed only with a hammer. Many directors, when faced with an action scene like this, would have come up with a long list of shots. An action scene always takes a long time to film, as there are so many different movements and angles to capture. Park did shoot different angles, but in the edit, decided to go with this – which is much more exciting and effective. Park likes film “where stories mostly take place in a confined space, turning it into a small universe unto itself.” (RedCarpetNews Extra), and, in the same interview, films that have little dialogue. This affords him the ability to tell the story visually, with mise-en-scène, rather than with words. When I run the Action On The Side projects, one of the exercises that I give directors is to write out the shot list and draw storyboards. Inevitably, as with any project, the director wants more shots than they need. I tell them to cut the shot list by half. It is better to combine shots now than on set. My rationale comes from my classes on mise-en-scène and from the work of Park Chan-Wook. He has inspired me to develop my visual vocabulary and have amazing mise-en-scène in my own projects. I now challenge every director to really think about their shots and how to use the information held within to tell the story. And if you want your own inspiration, turn to the work of Park Chan-Wook. The below is my first assignment for the Raindance MA degree. The assignment is to write an introductory blog post on ‘a significant film’. The New Zealand International Film Festival. 2008. Sitting in the back of The New Zealand Film Archive cinema. Excitement fills the darkened room. Granted, this could have been mainly from me, about to see something I had been eagerly anticipating. The screen fills with a series of three-minute short films from 35 auteurs from around the world, an anthology of films on Film: a series of love letters to the Cinema. For my first assignment for my MA programme, I have been asked to write a blog post on ‘My significant film’. This could be the film that compelled me to become a filmmaker; the film that inspired me; a film with deep and resounding significance. I am not writing about that film. Because I do not have one significant film. There is not one film that compelled me to become a filmmaker, nor is there one film that compelled me to become a Producer. There are many films. Or rather, there is Film. Instead I am writing about a film that represents FILM, and the love of Film. This is ‘A Chacun Son Cinéma / To Each His Own Cinema’ (2007). The extended title continues with “ou Ce petit coup au coeur quand la lumière s’éteint et que le film commence”, or “or the beat the heart skips when the lights go down and the film starts” (‘To Each His Own Cinema’, IMDb). This anthology was produced for the 60th Festival To Cannes as a Love Letter to cinema. The directors were from around the world, giving a global representative voice to the project. The 33 shorts were made by recognisable directors with acclaimed bodies of work; in the case of the Coen and Dardenne brothers, these were directing teams. Every one of the filmmakers are recognised as an Auteur. The word auteur in French translates to author; however the academic term ‘Auteur’ bears new meaning. The concept of Auteur was born from Les Cahiers Du Cinéma, a French film criticism magazine, started in 1951 (now online at cahiersducinema.com). In the January 1954 article ‘Une certain tendence du cinéma français’, François Truffaut proposed a ‘politique des auteurs’ – “a policy of focusing criticism primarily upon directors and specifically upon chosen directors whose individuality of style qualified them, in the eye of the Cahiers team, as ‘auteurs’” (Sarris, 1963). Andrew Sarris, in his article ‘Notes On The Auteur Theory in 1962’, shortened and translated this ‘politique des auteurs’ to ‘Auteur Theory’ (Buscombe, 1973). Auteur Theory bases itself in the idea that an author is the key creative voice in the production of a text; in cinematic terms, this is the director being the author, or auteur, of the film. Les Cahiers du Cinéma stated that not all directors reach the echelon of Auteur, staying within the realm of metteur-en-scène (someone who simply places within the stage), rather than being distinctive and recognisable as an Auteur. Their collection of Auteurs were considered the ultimate list, although regularly revised and revisited. Certain directors met their list of auteurs; these being predominantly European. The critics further extended their analyses to include John Ford, suggesting that his work within the Hollywood Studio System shows a directorial voice despite the system’s restrictions, thus making him an auteur: thereby “Ford” can be both read in the film text and positioned outside it as author (Wollen, 1972). Lynch’s avant-garde surrealist style was evident in his short, ‘Absurda’ (Lynch, 2007); if not during the short, then once his name appeared on screen, for those who know his oeuvre. Other films were similarly recognisable by their directors: Ken Loach’s naturalistic conversation in ‘Happy Ending’ (Loach, 2007); Lars von Trier’s violence in ‘Occupations’ (von Trier, 2007); Wong Kar-Wai’s luscious visuals in ‘I Travelled 9000 km To Give It To You’ (Wong, 2007). The entire oeuvre is a representation of the Auteur Theory. Here we have master filmmakers showing their craft in concise three-minute short films. The most significant of the shorts was, for me, that of a filmmaker whom I have studied since first studying film: the quintessential Australasian female auteur, the only female and the only Antipodean to have been invited to make a short as part of this project, Kiwi director, Jane Campion. From the opening of her short ‘The Lady Bug’ (Campion, 2007), I recognised her work. It is sometimes hard to dictate what makes a text recognisably of one person. For me, it could have been the colours, the shot composition, the female character, the location (a school hall similar to all those I have ever been in). I don’t know. But what I do know is that the short was recognisably a Campion film. ‘A Chacun Son Cinéma’ represents, for me, an opportunity to see the Auteur Theory in practice. These directors are masters in their field. The anthology is a masterclass in directorial voice, an exercise in mastery of the short form from talented authors. It was an introduction to new storytellers, as a taster of their style, as well as an opportunity to revisit the work of known filmmakers. I recommend ‘A Chacun Son Cinéma’ for every short film maker to see how it is done. Absurda. (2007). Short film. Directed by David Lynch. [Online]. Available from https://www.youtube.com/watch?v=C5kyNorrWLc. [Accessed 27 September 2015]. A Chacun Son Cinéma. 2007. Film. Miscellaneous directors. [DVD]. France: Pyramide Distribution. BRUNETTE, Peter. (2007) ‘To Each HIs Own Cinema (Chacun Son Cinema)’. [Online] Screen Daily. http://www.screendaily.com/to-each-his-own-cinema-chacun-son-cinema/4032712.article. [Accessed 27 September 2015]. BUSCOMBE, E.(1973). ‘Ideas of Authorship’. [Online] Screen (1973) 14 (3). pp. 75-85. Accessed from http://screen.oxfordjournals.org/content/14/3/75.extract#. [Accessed 27 September 2015]. Cahiers de Cinema. (no date). [Online]. Available from http://www.cahiersducinema.com/. [Accessed 27 September 2015]. Chacun Son Cinema (To Each His Own Cinema). (no date). Festival de Cannes. [Online]. 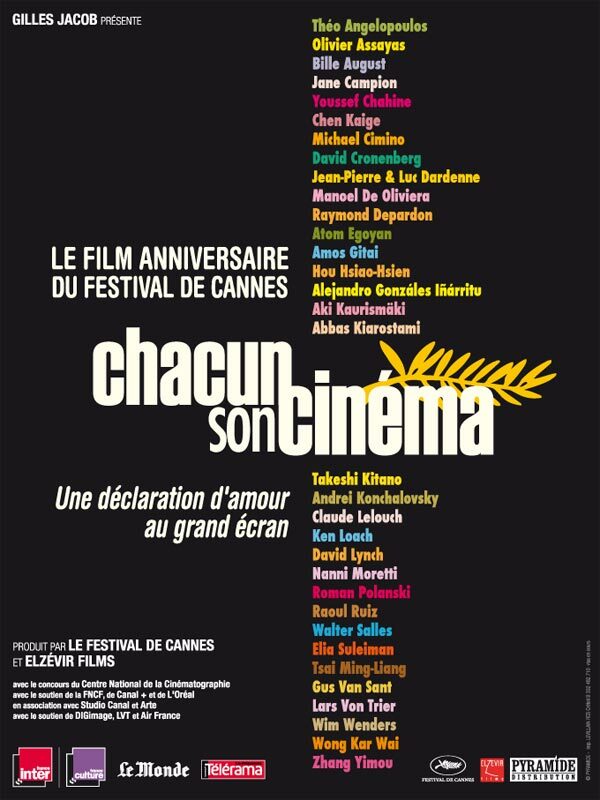 Available from http://www.festival-cannes.com/en/archives/ficheFilm/id/44f74064-9e58-4d60-86e1-c5dfa74ad89a/year/2007.html. [Accessed 27 September 2015]. DE VILLIERS, N. ‘We Are The World Cinema’. (2007). Senses of Cinema. [Online] . Available from http://sensesofcinema.com/2007/feature-articles/chacun-son-cinema/. [Accessed 27 September 2015]. François Truffaut & Auteur Theory. (2011). Notes on Short Film. [Online]. Available from https://alisashortfilm.wordpress.com/2011/05/06/francois-truffaut-auteur-theory/. [Accessed 27 September 2015]. Happy Ending. (2007). Short film. Directed by Ken Loach. [Online]. Available from http://www.dailymotion.com/video/x9cbm4_happy-ending-ken-loach_shortfilms. [Accessed 27 September 2015]. I Travelled 9000 km To Give It To You. (2007). Short film. Directed by Wong Kar-Wai. [Online]. Available from http://www.dailymotion.com/video/x2baxk_wong-kar-wai-i-travelled-9000-km-to_shortfilms. [Accessed 27 September 2015]. New World Encyclopedia. (no date). ‘Cahiers du Cinema’. [Online]. Available from http://www.newworldencyclopedia.org/entry/Cahiers_du_Cinema. [Accessed 27 September 2015]. Nga Taonga New Zealand Film Archive. (no date). [Online]. Available from http://www.ngataonga.org.nz/. [Accessed 27 September 2015]. NINVOID99. (2013). ‘The Auteurs: Jane Campion’. [Online]. Cinema Axis. Available at http://cinemaaxis.com/2013/09/30/the-auteurs-jane-campion/. [Accessed 27 September 2015]. Occupations. (2007). Short film. Directed by Lars von Trier. [Online]. Available from https://vimeo.com/92757522. [Accessed 27 September 2015]. SARRIS, A. (1963). ‘Notes On The Auteur Theory in 1962’. Film Culture no. 27, Winter 1962-3, pp. 6-7. SARRIS, A. (1963). ‘The Auteur Theory and the Perils of Pauline’. [Online]. Film Quarterly. Vol. 16, No. 4 (Summer, 1963), pp. 26-33. Available from http://www.jstor.org/stable/3185951?seq=1#page_scan_tab_contents. [Accessed 27 September 2015]. The Internet Movie Database IMDb. (no date). ’To Each His Own Cinema’. [Online]. Available from http://www.imdb.com/title/tt0973844/. [Accessed 26 September 2015]. The New Zealand International Film Festival. (no date). [Online]. Available from http://nziff.co.nz. [Accessed 27 September 2015]. TOURTELLOTTE, B. ‘Cannes directors peer into cinema’s past’. (2007). Reuters. [Online]. Available from http://uk.reuters.com/article/2007/05/21/uk-cannes-history-idUKL2018220520070521. [Accessed 27 September 2015]. WOLLEN, P. (1972). Signs and Meaning in the Cinema. London: Secker and Warburg. I handed in my final assignment for my BA(Hons) in Film today. Huzzah! When too stressed to write an essay, when the deadline looms, a writer succumbs to her last hope. A letter that I wrote to my computer during one of my frustrating writer’s block moments. Lots on at the moment. A breakdown (of what’s on. Not in me. Not just yet. I don’t have time to breakdown). I had my first class for the 16mm film course that I am doing with Alex Funke and Paul Wolffram. The classes are weekly until early-May, and also involve a weekend shoot in late April. During the course of the … course … we’ll be making a short film. Each of us will be camera operator/director for a scene. Some of us also have roles for the shoot. I’m HOD Sound, which I’m pretty stoked about. We’re shooting on an Eclair NPR, an Arriflex SR2, and a Bell and Howell Filmo. My research topic has been confirmed. I’m happy to inform you that we have accepted your “Sound on Film” proposal for your FILM 489 Research Project. All best for your Honours studies. I have my superviser confirmed. Now to begin my research into the use of orchestral music by New Zealand Composers in New Zealand Cinema, as representative of a national identity (…or something like that). An excerpt from a book I just started, that I had to share. (Film Music A Neglected Art by Roy M. Prendergast). It’s his thoughts on auteur theory and the role of a director – oh my gosh, it made me chuckle. I just started reading Film Music: A Neglected Art (2nd edn) by Roy M. Prendergast. Part of the preface made me chuckle, so I thought I would spend the last 20 mins of my lunch break transcribing it so you can read it too. The first edition was printed in 1977 by New York University (C). The second edition was printed in 1992 by Roy M. Prendergast (C). The preface has just explained the differences and improvements of the most recent edition.